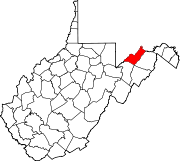 This is a list of the National Register of Historic Places listings in Mineral County, West Virginia. This is intended to be a complete list of the properties and districts on the National Register of Historic Places in Mineral County, West Virginia, United States. The locations of National Register properties and districts for which the latitude and longitude coordinates are included below, may be seen in a Google map. (#87000487) Route 1, Box 93A, Beaver Run Rd. (#92001631) Junction of Patterson Creek Dr. and Russelldale Rds. Wikimedia Commons has media related to National Register of Historic Places in Mineral County, West Virginia. This page was last edited on 27 September 2018, at 04:32 (UTC).